Q. What causes my toilet to fill up with hot water instead of room temperature water? Is it bad for my toilet and does it cost extra money when it fills with hot water? A. The main reason you may have hot water in your toilet is a bad flapper in the toilet tank or a bad fill valve. Either one of these can allow the water to seep into the tank. When you have a mixing valve on your toilet to prevent condensation, some hot water is introduced into the cold water line to warm the water just a little, but when the water just seeps a little at a time the hot water dominates the cold and you get a tank of hot water. It’s not bad for your toilet, but it could be hazardous to your wallet. Just like every other utility that uses hot water, the hot water being heating and leaking into the toilet takes gas and/or electricity and will run up your utility bill. Q. How do you get water in the toilet tank to stop over flowing? A. The fill valve in the tank has a leak in it. Also, if the fill valve has been replaced recently it is possible that it has been set too high. If the fill valve is old, it could do you no harm to replace it. Sometimes the shaft or wire that is used to set the level, corrodes off. By replacing it your problem should be fixed. Q. Is there anything I can do to get the scratches out of my toilet bowl? A. 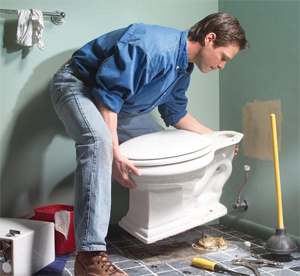 Yes, you can have your toilet refinished, which is a pain to do. It requires taking the toilet out and having it out of commission for a while. If you do decide to do this make sure you contact a professional and have a back up toilet available. Another option is to buy some porcelain patch and do it yourself. Just shut off your angle valve and flush the toilet until it is almost empty. If there is still too much water in the bowl to patch the porcelain then dump about a gallon of water in it, the bowl should empty completely. Then read the label and directions on the porcelain patch kit. Make sure to note how long the porcelain takes to dry. DO NOT turn the water back on until the patch is completely dry. Q. My toilet bowl has been “sweating” lately, is there anything I can do to fix it? You could install insulating foam products to isolate the water from the tank sides. Most major D.I.Y. retailers carry them for a reasonable price. I think they are about €8-10. Read the directions for complete directions, but you should completely empty the water from the tank, then use a hairdryer to ensure that the sides are absolutely dry. Cut the foam and apply adhesive. Let it sit for 6 – 8 (time approximate) hours and it will be ready to be refilled and useable. This usually works but isn’t guaranteed. The second option is to install a mixer valve which uses both hot and cold water to “mix” the water and adjust the temperature as you need to or until the condensation or sweating stops. Depending on how far away the hot water heater is, it may take quite awhile for the hot water to get there so in some cases, just running a hot water line is sufficient. This Works well but you will most likely need to call us for assistance. Lastly and more expensive is to replace the guts of the toilet and replace them with a “pressure assisted” unit, giving 6 litres per flush. This option is a water saver and works very well – no tank sweating at all. 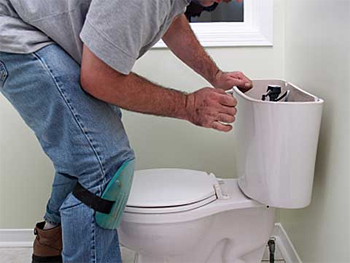 Or total toilet replacement – Pressure Assisted Toilet – should you need to replace your old toilet. Might cost €250 on up but well worth it. This toilet has a pressure tank in it inside the water tank. Guaranteed to do the job and you get a great new toilet that works well. Q. My toilet randomly empties itself of water. What would make the toilet empty itself without anyone flushing it and how can I fix it? A. There are a couple answers to this question, but this solution fixes it 99% of the time. Poor venting, or no venting of the fixture. Vents allow for air flow to the toilet sewage system. Without the vent, air pockets form in the waste branches which can cause what is called back-siphoning. The air in the system, without a vent, can only escape through the sewer. It can pull the water in the trap of the toilet with it.